The early summer sun is peeking through the windows on the top floor of Restaurang Landet at Telefonplan. The venue’s tiny stage is crammed with instruments, but it’s still a couple of hours before anyone’s going to play them. It’s late afternoon, and for now the venue is empty except for a gang of young musicians, eating pizza and drinking beer ahead of their show later that night. Together they make up Melby and Cat Princess, two of the brightest new bands around, and two of the jewels in the crown of Stockholm label Rama Lama Records. On the day of the interview, they’re both playing at a release fest for the brand new Melby EP. Axel Franzén and Sixten Engqvist are the duo behind Rama Lama Records. 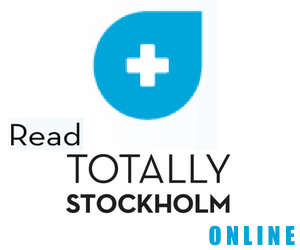 Engqvist says: “We started out as a music blog, with the goal to promote unknown artists in Sweden. From there it evolved to a radio show, where we did the same thing and interviewed different people in the music business. Then we felt that the most direct way to promote unknown artists was to actually release their music, so it was a logical step to start a record label. Axel: We wanted to deal direct with the artists, and put on shows and so on. When we had a blog, we used to get spammed by like 100 mails a day. Pretty early on in our blogging days, back in 2014, we got attached to PNKSLM, and they reached out to us. And that was an inspiration, that a record label could be like that, and not the stereotypical ‘bad guys’. In the digitalised new music world, we think that indie labels should act as a tastemaker. Sixten: We became bigger fans of the label than fans of the bands. We trusted the label to put our great music. You’d listen to every new artist they put out. And that’s what we want to do with our label. We want people to trust us, that they’ll enjoy the bands we put out and that they can come to our club nights and like the music we play, the acts from other labels we bring in, stuff like that. Axel: Labels like Sub Pop might have had the same status, but things are changing all the time and everything is getting smaller, and I think that’s a good thing. I think we are beginning to build a scene around the label, with the bands supporting each other and being friends as well. Sixten: That’s a big part of it. Axel: Yeah, if you see a band like Hinds, a lot of their success is because they’re friends, and you can tell from the outside. We want that friendly touch too. You started with signing Melby and Steve Buscemi’s Dreamy Eyes? Sixten: Yeah, I was friends with all of Steve Buscemi’s Dreamy Eyes and Axel was friends with some of them. So we knew them, and we liked their music. We had said a couple of years earlier that we should start a record label, that’s how everything starts with us. We joke about something and then two years later it’s reality. Then we heard Melby’s first two songs, and really liked them. We contacted both of them, and they knew each other. They talked about it and they all thought it was a great idea. Axel: We wanted to start a record label, and we wanted to start with the two bands we thought were the best two unsigned bands in Stockholm. So we reached out to them, and they trusted our idea and liked it as well. We needed them to start the label, because you can’t start one without having any bands. Everyone got along pretty well. Are: We [Are and Matilda] had played together in a more folky, singer-songwriter project before with acoustic guitar and cello. But Matilda talked about wanting to play electric and with drums. Matilda: I wanted to have a rock band! So how did it develop from there? At what point did you become officially Melby? Are: Pretty soon. I think we got our first gig pretty soon, one of our mutual friends arranged a little festival outside of Stockholm. We got that gig. Matilda: I played the drums then, and sang. We recruited Teo some months later as the drummer, and then everything became better. David: It took a year before we released the first single [‘Human’]. Musically, you’ve got this kind of dreamy loose sound, that wanders it lots of different directions and explores lots of different things. So I was wondering what the songwriting process is like in that, who brings in what? Matilda: Everyone except Teo writes songs, so I guess that contributes to the many different influences and directions. David: I think our songwriting styles are quite different, and then we bring the songs to rehearsals and reform them into our mutual sound. Are: Yeah, I think they sound quite far away from each other, and then when we come with them and show them to the others they fuse together. We still change the songs that we first played two years ago, from gig to gig, we always try new things. So gradually they become more complete [as a band project]. Which feeds into my next question: With your style, is songwriting a long process? Because there are so many touches and elements to the songs, there’s a lot going on. So does it take a long time to put it all together and perfect it, to get all those touches to be exactly right? David: Yeah, and there’s quite a difference between the studio and playing live. When we’re in the studio, one song can have fifty tracks in the mix. Are: More I think. I think ‘Framtiden’ has ninety with all the sound effects. David: The sound is rawer when we play it live, and much more detailed on the recording. Are: There’s also three steps. When we come with the songs individually we have a lot of ideas, and then we rehearse them, and so then when they come to the studio there’s a new step with even more ideas. So absolutely, it takes a lot of time. Would you say you’re pretty perfectionist? Matilda: Yeah. David and Are especially. The last week or so [of the EP] they would stay in the studio until midnight. David: The four tracks took more than half a year to record. So how long do you have to work on tracks till you get to the stage where you get comfortable enough to release them? Are: All the songs we’ve released to date, date back from when we started the band. So it must feel great to finally get them out? Matilda: Yeah! Now we can finally move on! But I’ve been really looking forward to releasing it. ‘Cross’ and ‘Pat’ have been my favourite songs, my babies, so it feels really good to release them. You have got a really wide range of styles in your music, it covers a lot, as we’ve said. So what are some of the influences that feed into Melby? What kind of genres were you working in before you came to this band? Are: I used to play free jazz before, though I don’t know how much that reflects on the music. David: I listened to a lot of psychedelic rock, seventies rock. A lot of soul. Are: I think we all are very broad in our tastes. Matilda: We’ve been compared to Beach House and Cate Le Bon, and I listen to them a lot. But I also listen to hip hop. And disco. Are: In the years preceding the song we’ve released now, I listened a lot to James Blake, Bon Iver, mellow indie like that. I think a lot of the songs I’ve written are more mellow, and I think it reflects that. If Rama Lama are a family, then Cat Princess are the chaotic cousins. Robin Åberg, Isabelle Friberg, Robert Lanneborn, Victor Klint and Nils Krång owe their formation to a house party, and their Please Me EP, released last year, was full of high-energy indie-rock worthy of that origin story. They’ve already achieved a lot, but the band only actually got together in early 2016: Åberg says: “Robert, Isabelle and I had another band before, then that band split up and we continued. But we didn’t have a drummer, and Robert knew Victor from before, so he joined. We then played a gig at my birthday party, and Nils was there. Victor: We got really drunk, and decided that Nils and me and someone else were all going to improv a gig where Nils would sing, and from then on he’s been our singer [laughs]. Robin: Yeah, I couldn’t play the guitar and read the lyrics on my phone and sing all at the same time, so we needed someone to take the load off. Victor: And we knew that Nils had star power. Robin: So Nils joined the band, then after one rehearsal we had our first two singles. You only started playing together in January 2016 right? And the EP came out in December. So was it a really rapid process. Victor: Yeah, we threw together a few songs and then went straight into the recording studio. Nils: I think we wrote the songs on the EP in winter, and then recorded it in May. Victor: The first songs we recorded were right after Nils joined the band, in January, February. Robin: The first weeks were quite productive, as it was then that we wrote all the songs we’ve released so far. Then it took some time to mix and produce the EP. You signed to Rama Lama after you put out the EP. But you were playing with Rama Lama bands before that, like Melby and Steve Buscemi’s Dreamy Eyes. So how did you guys end up in those circles? Robert: I first saw Melby in a nation in Uppsala. Robin: At that start of last term at university, Axel recognised me because were in the same class, we study together in Uppsala. I charmed him [laughs], but yeah, we got to know each other. We were going to release the EP through another label, but that never happened, so we released it independently. Then as that other label wasn’t happening, Rama Lama jumped in and we signed. Isabelle, you directed the video for ‘Lust And Life’, and you said you took aesthetics hints for that from Twin Peaks and Days Of Our Lives. So is building an aesthetic for Cat Princess, outside of just the music, a big part of the band’s identity? Isabelle: Yeah, I do all the graphics and videos and stuff. I go for a tacky style, like MTV or whatever. You also had the mini-documentary? Isabelle: Yeah, I think I made It while we were recording, in our spare time. Robert: We have a lot of humour and laugh together. We try to share that feeling. Robin: We have a relaxed attitude to our fans, we don’t want to act pretentious or whatever. But is it something you want to do, to build a world for the band outside of the music? With all the artwork, videos, little pieces like the documentary? Nils: Well, it’s fun isn’t it? Robin: Yeah, but it’s the illusion of something greater. If you can get a hint of that. So where are you guys now in what you’re doing? Please Me came out last year, you signed to Rama Lama, so what’s next, what’s in works after this? Isabelle: We’re going to do some recording in June. Victor: At least two songs. We’ve got a few concerts coming up, a few secret ones and a few not-so-secret ones. But are you recording towards a new EP, or an album? Nils: Perhaps a new EP. Four songs or so. Also, our songwriting has been shifting a bit. We like to shift instruments and to try something new. Get out of the comfort zone. So now Isabelle plays the synthesiser on one song, Robert plays the bass, I play the guitar. And Robin is playing maracas! I sing in the band at the moment, but I’m originally a guitarist so it feels really good to get my grooves on, on the guitar again. Robert: It’s a good way to avoid getting stuck in old habits. I think we always want to be a band in progress at all times, we don’t want to get stuck in our genre. Nils: And to express ourselves differently. It’s a source of fresh creative energy? Robin: Some people criticised the EP because people said it went in too many directions at once, but we don’t think that’s a bad thing. Victor: I want to point out that we got praise for that as well. You can’t make everyone happy. Robin: We don’t want to do the same song over and over again. It’s a cliché thing to say, but still. Victor: When we play live we start off more rock and roll, and then in the middle we go a little more chill, and then more pop. And then in the end more punk. I think there’s a good drama in that. Melby’s release show is tonight, but Rama Lama already have their eyes on their next move. 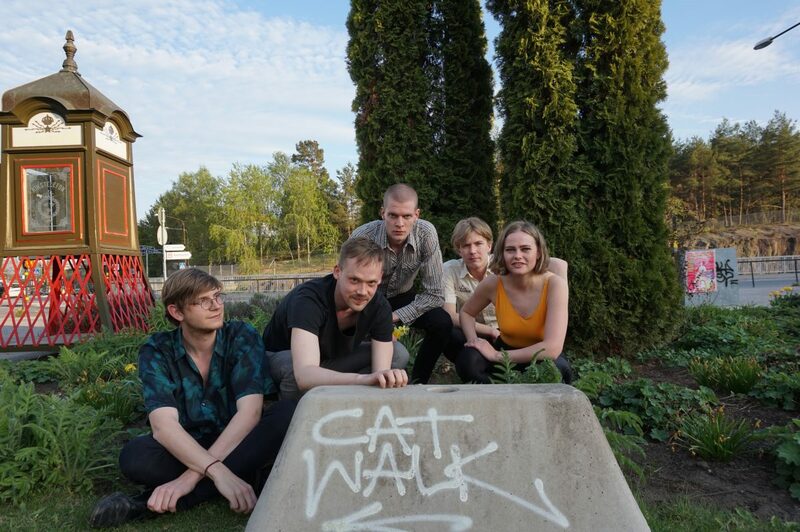 “We’re putting out Delsbo Beach Club’s new single”, says Engqvist, “and we have a gig on June 17 with Steve Buscemi’s Dreamy Eyes, Cat Princess and Delsbo Beach Club. Steve Buscemi’s Dreamy Eyes’ debut EP is being mixed right now, that’ll be out in the autumn at some point. And we’re throwing a one-year anniversary party out in the archipelago, with hopefully all the bands playing. Axel: We’re also constantly trying to build up our reputation. Everything that we do is a part of building something, and I think that’s very important. And finding new bands, but there’s no rush with that because I think we have four of the best Stockholm acts. Sixten: We don’t want to sign new bands just to have more bands, it has to feel right. Axel: They’re all developing bands, and we develop with them. The Melby EP is out now. Rama Lama Records have a Summer Party with Cat Princess, Delsbo Beach Club and Steve Buscemi’s Dreamy Eyes on June 17.